This article is about a promising indian legbreak spinner amit mishra, who also bats well. He is a test player and har also played ODI and T20Is for India. Here is given the profile, career and records of this talented cricket player. 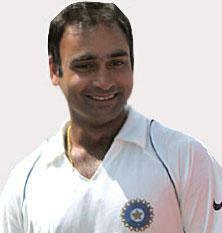 Amit Mishra is one of the young talented spinner for India after Anil Kumble. His leg break bowling has impressed the selectors and he made his Test debut against Australia and took 5 wicket haul in the match. But his later performance was not so good which results in the lost of place in the Indian Test side. But a very good performance in IPL, make his comeback in the Indian ODI Team on the West Indies Tour 2011. He was also selected for the Test Team on the England Tour. He was not much successful with bowl in the Test Series against England where India lost the series by 0-4, but in the last match he made half centuries in both the innings of the match.